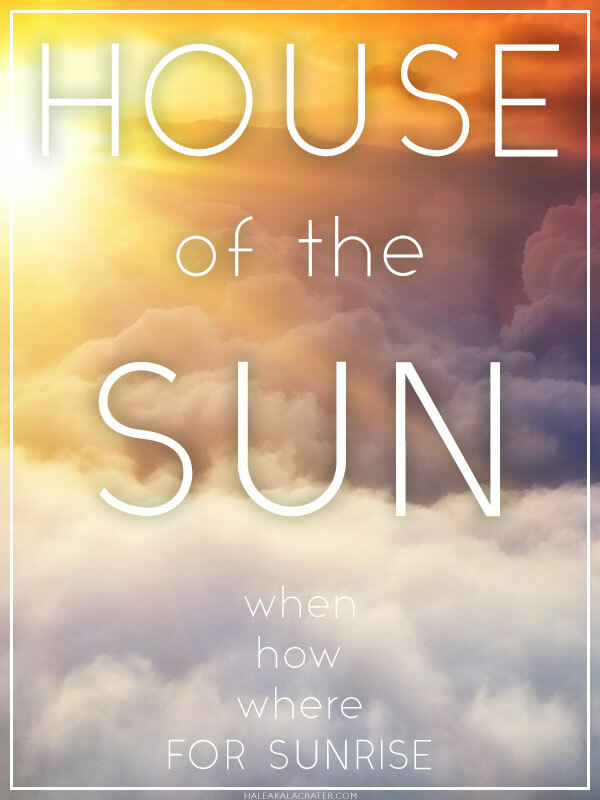 One of the most overlooked yet absolutely breathtaking areas of Maui, Upcountry encapsulates everything that is beautiful about life on a Hawaiian island. From panoramic views to lush rolling hills to locally-owned farms and galleries, there are plenty of ways to keep yourself entertained in the vast areas of Upcountry Maui. One of the most all-encompassing guided tours on Maui, Valley Isle Excursions offers a Central Maui, Upcountry & Haleakala Park Tour that includes a visit to such Upcountry areas as the 10,000 foot summit of Haleakala National Park, the historic paniolo (cowboy) town of Makawao, scenic forests and ranches, renowned churches and buildings, and even a classic picnic in a gorgeous Upcountry setting. Tours include round trip transportation in a custom built 12 passenger luxury van, as well as knowledgeable local guides, non-alcoholic beverages and two meals. If you’re interested in seeing the most gorgeous areas of Upcountry, as well as making other stops at hotspots like Kepaniwai Gardens and Iao Valley State Park, this tour is an excellent way to sightsee while learning valuable insight about a range of Maui’s various landscapes. Combine three amazing Upcountry experiences into one with this intriguing tour from Skyline Hawaii. Starting with a rather brutal (but totally worthy) 2am to 3am pick up from your accommodation, you’ll then be driven through the hills of Upcountry to the summit of Haleakala in time for a sunrise above the clouds, jackets and gloves included. Shortly after, you’ll be driven back down to the entrance of Haleakala National Park at 6,500 feet to start the 21 switchback, downhill bike riding portion of the tour, which includes stunning views of Upcountry and the West Maui Mountains. Then, you’ll be fed a continental breakfast before your final Upcountry adventure – a 5-line zipline tour, swinging bridge and a ride on Hawaii’s only pendulum line, where you’ll reach speeds of over 45mph! We love this tour because of its wide range of activities, and the fact that you still arrive back at your hotel with plenty of time for more daytime activities. If downhill biking along the slopes of one of the world’s most scenic volcanoes sounds like a dreamy bucket list item come to life, you’ll be thrilled to learn about the self-guided Haleakala biking tours with Bike Maui. Choose from the Sunrise Special and Summit Deluxe to experience a guided van tour to the summit of Haleakala Volcano and through the National Park, or opt for the Haleakala Express Tour to get straight to the good stuff: the bike ride. Coast down some of the state’s most epic roads to conquer the 23-mile route back to Haiku, and take plenty of time for yourself along the way to stop for photo ops, coffee, breakfast, shopping, talking story and plenty more. You’ll see good reason why this is one of the top three most popular things to do when visiting Maui. What was once a secret amongst Maui cyclists in the know, bike enthusiasts are beginning to see how many biking opportunities are available on Maui. Though some areas are not recommended (ex. the Pali between Maalaea and Lahaina), there are many great spots to bike. Krank Cycles, in Makawao, have many different kinds of rentals for those looking to ride the road or mountain bike trails. Their inventory includes BMC, Giant, LIV, Juliana, Transition, Santa Cruz and many more. Their bike rental shop is only a few minutes away from the famous Makawao Forest Reserve and less than 20 minutes from some of the most sought-after uphill road biking in the world. What once was a secret amongst cyclists in the know, visitors are beginning to see how many biking opportunities are available on Maui. Though some areas are not recommended (think the Pali between Maalaea and Lahaina), there are many great spots to bike. 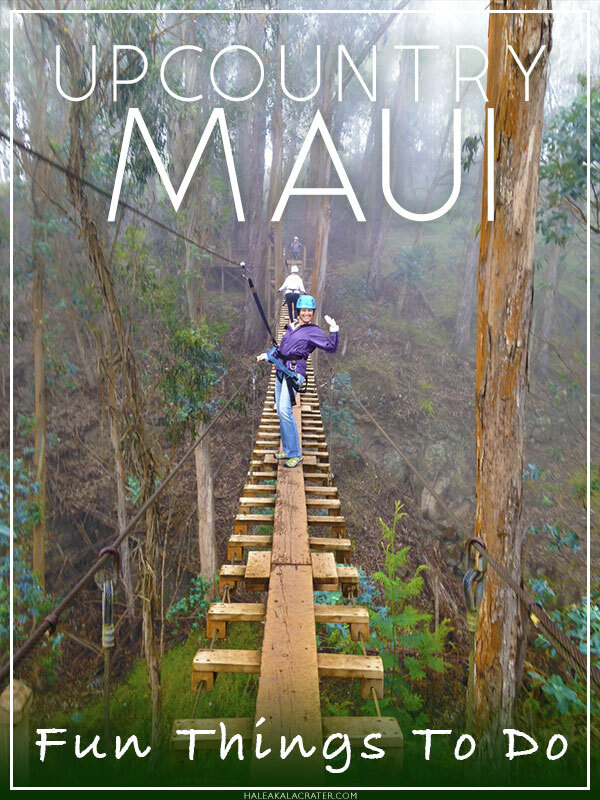 Though not located in a well-visited area of Upcountry, Rappel Maui offers three exciting tour options on the grounds of a 30 acre botanical garden along the Hana Highway. Guests will receive a full safety briefing, demonstration and plenty of time to practice their skills, as no prior rappelling or climbing experience is necessary to participate. Professional guides are there to assist in every step of the process, and guests will rappel down a jungle wall before moving onto cascading waterfalls up to 50 feet in height. For those with rappelling experience, two alternate tour options are available that will keep your adrenaline pumping and your adventurous spirit alive and well. We love this tour, as it is the only one like it on Maui, and think it’s a fabulous way to experience the natural beauty of The Valley Isle in a completely new and thrilling way. 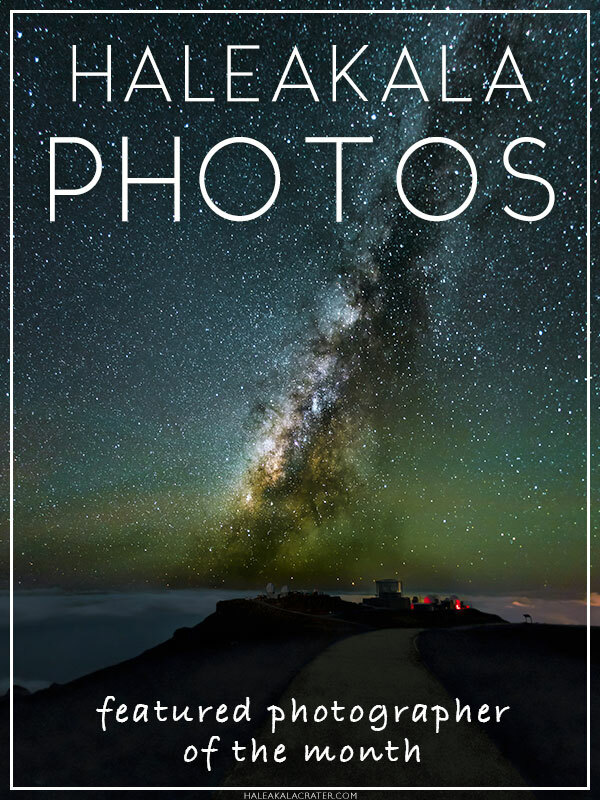 While most people are wowed by the magnitude of Haleakala Crater during their sunrise or stargazing tour at the summit of Haleakala Volcano, not many travelers make the trek into it for further exploration. Hike Maui, however, offers a moderate level 7 hour, 4 mile guided hike through the Crater, which is larger than all of Manhattan, for a day of stunning sightseeing in this expansive, predominantly barren landscape. The tour guarantees no more than 11 guests, and includes transfers to and from your accommodation. 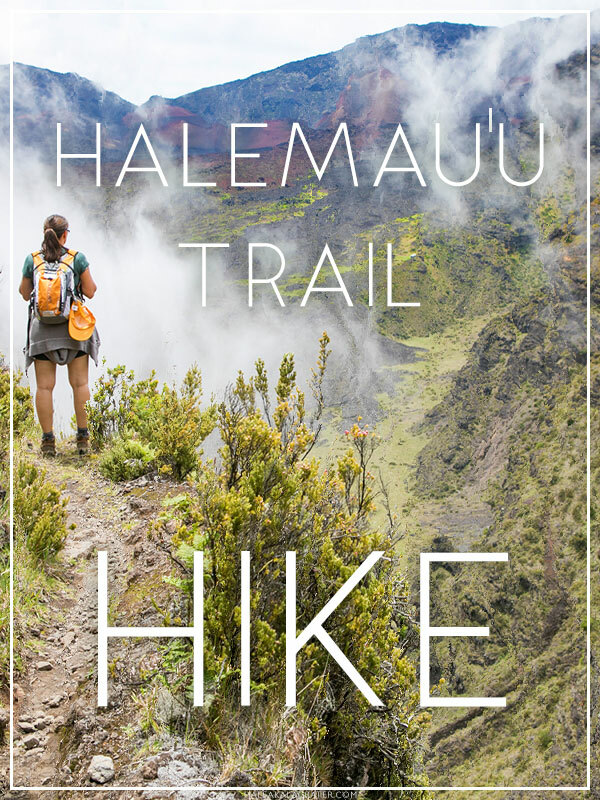 Guests must be at least 8 years old, and it is recommended to bring your own camera, cash, layers of clothing and sunscreen, though Hike Maui provides a backpack with all necessary rain gear, bug repellent, water, lunch and snacks. Even if you don’t consider yourself a huge hiking enthusiast, this tour offers an inside look of Maui that remains a mystery, even to a large number of local residents. A relative newcomer to the Maui tour scene, Maui Craft Tours offers a range of inventive daily tour options focusing on the top craft food, beer, wine, and spirits produced locally on The Valley Isle. Their tantalizing Taste of Upcountry Tour features an initial meet-up point at the Mill House Roasting Company at Maui Tropical Plantation, where guests are invited to sample locally roasted coffee before heading to their first Upcountry stop, Surfing Goat Dairy. There, participants will be treated to a private tour of the dairy farm and enjoy a homemade farm-to-table lunch featuring their flagship goat cheeses. Continuing the Upcountry adventure, guests will then take in the views from the grounds of Maui’s only winery, MauiWine, and taste craft wine varieties before sampling fresh fruit from Kula Country Farms. Finally, guests will visit Hali’imaile Distilling Company for an expert tour and tasting before heading back down the volcano for a final visit to The Mill House Restaurant in central Maui. Tours include private van transportation, small group sizes, entrance fees, tote bags and more, and we highly recommend it for not only the opportunity to meet local crafters and taste Maui’s top craft creations, but for the many stunning views of Upcountry you’ll be treated to along the way. Mahalo for reading our list of the best Upcountry Maui activities, and we wish you plenty of future exploration of this underrated area of tropical paradise! Held every third Friday of the month in the Upcountry town of Makawao, Maui locals and travelers meet on Baldwin Avenue for the Makawao Friday Party, a staple for those who enjoy live music, shopping from local vendors, food trucks, keiki-friendly activities and more, all backed by a stunning view of the sunset from the slopes of Haleakala Volcano. Get there early to score a parking spot and browse the local art galleries, and head to nearby restaurants like Makawao Steakhouse or Polli’s Mexican Restaurant for a drink or dinner after. Well known locally as Maui’s beloved Paniolo – or Hawaiian cowboy – town, Makawao continues to host yearly Makawao Rodeo events for locals and spectators alike. Presented by the Maui Roping Club at Upcountry’s Oskie Rice Arena, Makawao Rodeo’s most anticipated event is held annually on July 4th, when live music, food and fun, family-friendly events are planned throughout the day. While rodeos aren’t an activity most people consider when traveling to a tropical island, rest assured that it is a memorable experience for all involved. Formerly a multi-use plantation store for Upcountry workers in Maui’s pineapple fields, Hali’imaile General Store was reopened as a restaurant in 1988 by owner and Head Chef, Bev Gannon, along with her husband. Winner of the Ai’pono Award for ‘Chef of the Year,’ as well as Maui’s Best Chef, Bev has created a menu focusing on locally-sourced, quality ingredients inspired by the island experience and natural surroundings. One of island’s top restaurant destinations, Hali’imaile General Store is open Monday through Friday for lunch and nightly for dinner. Located at 3,200 feet elevation on the slopes of Haleakala Volcano, Kula Lodge is one of Maui’s top locations for sweeping island and ocean views, all located in a lush private garden or cozy lodge with a delicious breakfast, lunch and dinner menu, wine, beer and specialty cocktails. Grab a table in the Kula Lodge Garden Terrace and enjoy a variety of wood-oven pizzas and a scenic sunset, or their island-famous toasted macadamia nut pancakes with a view during breakfast hours. If you plan on traveling to Maui during the month of October, or for the (arguably) best party of the year – Lahaina Halloween – don’t miss out on one of the country’s most unique pumpkin patches in Upcountry Maui. Run by a team of fourth generation family farmers, Kula Country Farms is host to an annual pumpkin patch located at 3,000 feet of elevation, and offers otherworldly panoramic views as well as live music, pumpkin-carving, costume contests and free entrance. Grab a pumpkin to-go, and get a true taste of what fall is all about on The Valley Isle. Supplying ingredients for local eateries Pacific’O, The Feast at Lele and Aina Gourmet Market, O’o Farm has grown from a modest citrus and stone fruit orchard into a world class destination for Hawaiian coffee, lettuce and garden vegetables, herbs, flowers, fruit and more. Spanning 8 acres in a high altitude location of Kula, guests can opt for a more immersive, farm-to-table experience during their weekly Seed to Cup Gourmet Breakfast Tours or Gourmet Lunch & Farm Tours. One of our favorite stops after watching a Haleakala sunrise or after a beautiful drive around the back side of Haleakala National Park, Grandma’s Coffee House is a true Maui gem and culinary highlight of the small town of Keokea. With a long history in local coffee roasting and blending beginning in 1918, Grandma’s is now in its fourth generation and remains one of the best places to drink a cup of coffee and treat yourself to delectable breakfast items while talking story with friends, family, locals and travelers. One of the largest supporters in the effort to stock locally-sourced ingredients, food and gift items, Ulupalakua Ranch Store is a highly recommended pit stop for lunch in Upcountry Maui. Located across the street from MauiWine, Executive Chef Will Munder recommends the slow roasted Maui Cattle Co. Beef Brisket with homemade BBQ sauce, the Ulupalakua Lamb Burger or Upcountry Caesar Salad for a taste of authentic, local ingredients with a country twist. While you’re here, also be sure to stock up on locally-made souvenirs. Located at the Kula Malu Town Center in Pukalani, the Saturday Upcountry Farmers Market is the perfect place to stock up on locally-grown food and support Maui’s farmers and small business owners in the process. A Maui event for over 40 years, guests are invited to grab ingredients for a fresh fish dinner, or shop a variety of raw and vegan prepared food, Maui grown coffee, and tropical plants and flowers. Alternately, Maui Nui Farm hosts a weekly farmers market on their 40 acre farm in Kula, and the excellent Kula Country Farm Stand is open Monday through Saturday. A non-profit, community-based visual arts education organization, the Hui No’eau Visual Arts Center is located Upcountry in the historic Kaluanui Estate. Featuring year-round classes, camps and workshops in drawing, painting, photography, printmaking, jewelry, glassblowing, ceramics and more for a variety of ages and interests, guests can also visit to browse the latest exhibition or assortment of handmade gift items. Check their monthly calendar for galas, music and arts events, and join a class for a memorable Maui experience. Widely regarded as one of Maui’s most charming and uniquely historic towns, Makawao is also home to a very talented artistic and creative community. Whether passing through or staying for an extended period, be sure to shop the range of local art galleries, boutique clothing and gift shops, Polynesian jewelry stores, photo shops, furniture stores and glass blowing studios for a look into the local life of this lesser visited Maui destination. And if you run out of things to shop for, warm treats from T Komoda Store & Bakery are highly recommended. Founded in 1974 by a California winemaker and the owner of Ulupalakua Ranch, MauiWine remains Maui’s only winery, and a stunning one to boot. Located on 23 acres of Haleakala’s volcanic rich soil, visitors of MauiWine can spend the day sampling locally-made wine in the comfort of the scenic and historic King’s Cottage or Old Jail, or go all out on an exclusive vineyard experience. Sample their range of Pineapple, Estate and Rose Ranch wines, and take home a bottle for a Maui-made souvenir unlike any other. Home to 45 varieties and 55,000 lavender plants, the Ali’i Kula Lavender Farm is located at 4,000 feet on the slopes of Haleakala, offering dramatic views of the West Maui Mountains and Maui’s lush shoreline. Initially created in 2001 by Agricultural Artist and Horticultural Master, Ali’i Chang, Maui’s lavender farm is also home to olive trees, succulents, hydrangea and other plant varieties. Take a tour of the farm on their daily Guided Walking, Guided Cart and Gourmet Picnic Lunch Tours, and be sure to sip tea and try their homemade lavender scones on the deck. A winner of 18 national awards, including the ‘Best Goat Cheese spread in North America,’ Surfing Goat Dairy is a goat farm producing artisanal goat cheeses on 42 acres of Haleakala’s lower slopes. Their casual 30 minute tours, 1 hour Evening Chores & Milking Tours and 2 hour Grand Dairy Tours are a great option for visitors to the farm, or simply grab a seat, sample their variety of gourmet goat cheeses and gourmet goat cheese truffles, and say hi to the goats on your way out. Either way, it’s a win win.